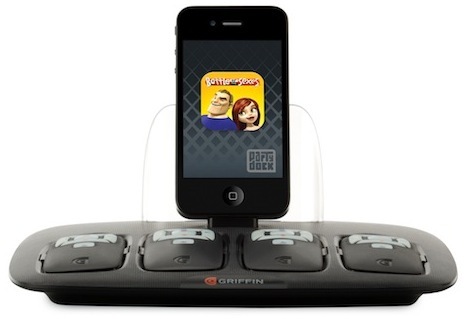 Griffin’s latest iPhone/iPad peripheral was leaked earlier in the week by the FCC, which seemingly prompted the company to officially announce their new “Party Dock” docking/gaming peripheral for iPhones, iPods, and iPads. 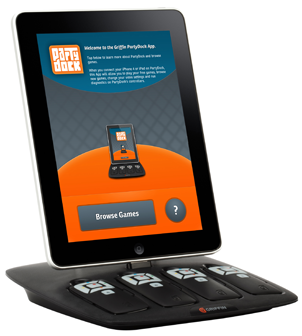 The device allows you to dock your iDevice of choice into a base, which contains 4 remote controllers. The controllers appear to be quite basic, Apple remote style controls that would be more suitable to casual and social games. The device then hooks up to your TV, allowing for up to 4 players to play games designed specifically for the accessory. The Party Dock will apparently come with 3 demos and 1 full game, with other titles to be available for download from the iTunes App Store. The device will also allow you to watch YouTube videos, and view photos and movies on your TV, presumably navigating with one of their controllers. No word yet on pricing or availability.